Canadians who were transfixed by the rescue of 33 trapped Chilean miners last October now have a chance to get closer to the drama. One of the rescue capsules built to pull the men up will be on display in Toronto through Wednesday. Canadians who were transfixed by the rescue of 33 trapped Chilean miners now have a chance to get closer to the drama. One of the Fenix rescue capsules built to pull the men up from 700 metres of rock at the San Jose copper and gold mine near Copiapo last October will be on display in Toronto through Wednesday. The metal capsule is painted in Chile's national colours of white, red and blue, with scratches marking its journey into the depths of the earth in mid-October 2010. It made its North American debut Sunday at a convention of the Prospectors and Developers Association of Canada. The capsule had previously been displayed in China. The bullet-shaped pod was something of an attention magnet, drawing a constant crowd over the weekend, including Chilean Mining Minister Laurence Golborne. 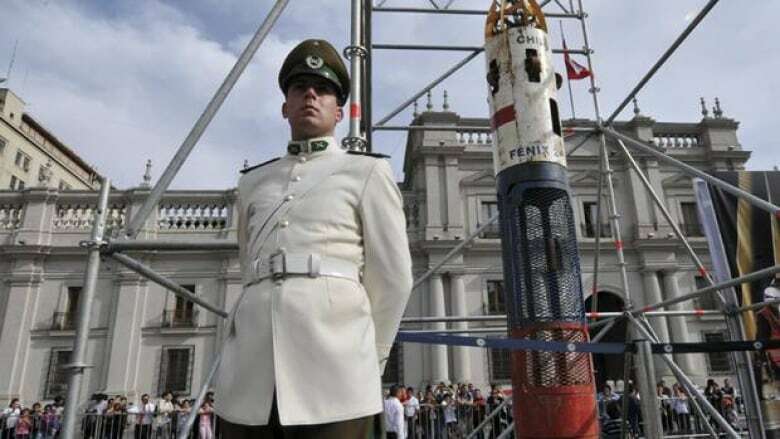 He led the team responsible for the rescue and said the capsule represents the strength and unity of the Chilean people. Many Canadians who took their picture with the capsule called it a surreal experience. Marc Gasparotto of Thunder Bay, Ont., said seeing the pod brought him a lot closer to the harrowing rescue, and Toronto resident Dave Prince said the capsule was a good visual reminder of the risks miners face every day. The men trapped in the San Jose mine spent 69 days underground in the wake of a cave-in on Aug. 5, before being brought to the surface.